I am victorious! 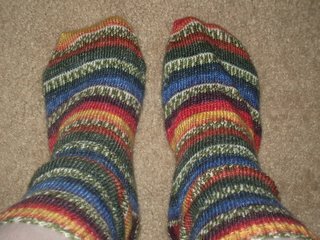 I have finally completed BOTH socks! Woot! Are you ready for more pictures? Here's one to prove that yes, I WILL wear them. How exciting! Tomorrow (if I remember) there are some other things that I will post, and maybe I'll drop by Wal-Mart and pick up my two rolls of film. One's so old, I don't even remember what is on it. I'm not even sure if there ARE pictures on it. It was only 12 exposures, and it went in one of those REALLY old cameras...the ones that were really flat. Who knows what will be on it...with me, there's no telling, but I'm hoping that they put the pictures on a CD so that I can upload them easily. If not, we'll have to do it the old fashioned way, with the scanner. Fortunately, the CD burner is in the computer with the scanner, so that should make it easier. 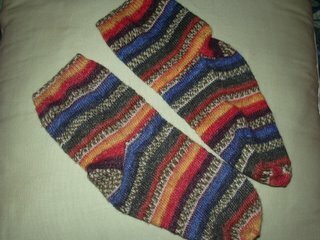 Absolutely great looking socks -- I love that color pattern! Gorgeous socks and I love the color. Laura, this is too funny! 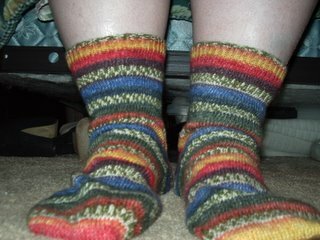 I just finished some socks with the same yarn! But yours turned out much more symmetrical than mine. I tried to get the yarns started in the same place, but no luck. I also made them too loose, but I like them anyway. I've got mine posted in my "Finished Projects" pictures on my blog.